thinkorswim is a very popular and awesome trading platform. thinkorswim has fantastic features for traders with a technical background and allows easily getting real-time data for stocks, options and pairs in Microsoft Excel. If you have no opened account, definitely try. You are welcome to point me as a referrer. My account name is Vaselenko. The RTD.DB product allows updating databases using thinkorswim data via Excel formulas and has preconfigured databases. As you may see, thinkorswim has not only standard option chain data but also greeks, calculated implied volatility, probabilities, etc. As you may see, RTD.DB updates 4008 option contracts (rows) in the OptionDayHistoryTOS table. We have successfully tested loading data for 40K option contracts also. Create an RTD database on your server. Configure a connection to your server. Configure a list of option contracts to refresh. Run RTD.DB using the link from &apos;Start, All Programs, Gartle, RTD.DB&apos;. RTD.DB will start updating the preconfigured local Microsoft SQL Server Compact database with data from Yahoo Finance for currencies, stocks, and options. 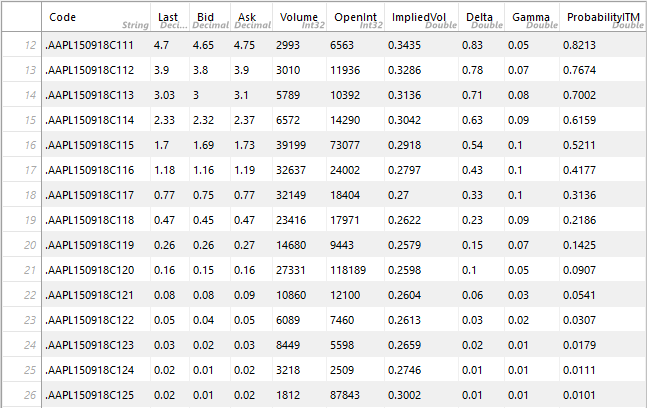 For example, you may see the OptionDayHistoryYahoo table. Open the folder of the unzipped download package. Open the RTD Database folder and open a folder for the target database platform. Run the 1-edit-config.cmd batch file and edit the connection strings to your database server. Run the 2-create-database.cmd batch file. Run the 3-rtd-setup.cmd batch file. Run the 4-rtd-list.cmd batch file. Run the 5-rtd-grant.cmd batch file. 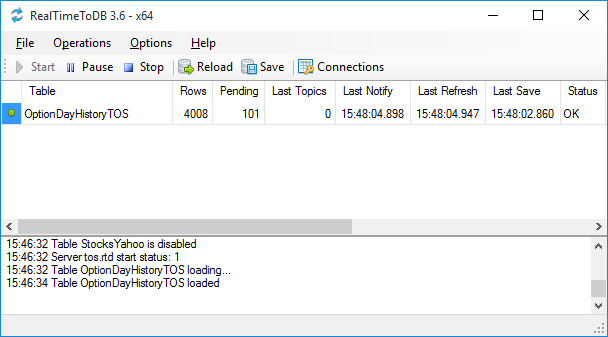 As a result, you will have the RTD database on your target server. If the files have other names, please, read the readme.txt in the setup folder. Run RTD.DB if it is not started. 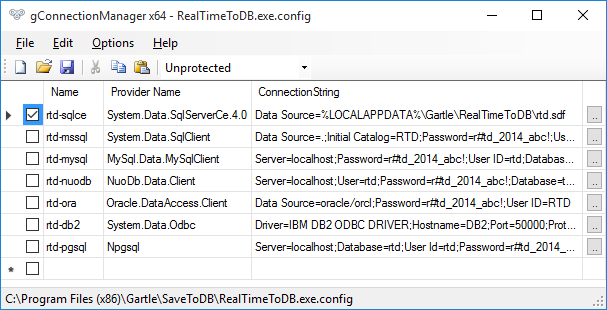 Edit and enable the connection string to your server and disable the default SQL Server Compact database. Click the Save button and close the application. Click the RTD.DB Stop button and then click the Start button. Here is a screenshot of the gConnectionManager application used for editing connecting strings. 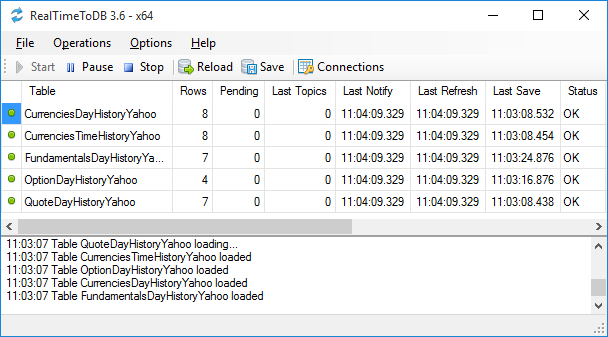 The RTD database contains preconfigured tables for loading various data from various data sources with various time frames. Open the RTD database in your database manager. Open the rtd.RealTimeTables (rtd.real_time_tables) table in edit mode. Set 1 into the IS_DISABLED column to disable loading and set the value to NULL to enable loading. For thinkorswim, activate the OptionDayHistoryTOS table. See RTD.DB Database Configuration about configuration tables. You may use Microsoft Excel to edit configuration tables if you have SaveToDB add-in installed. Open the RTD Workbooks folder in the downloaded package. Open the workbook for your target server. For example, rtd-mysql.xlsx for MySQL. Open the SaveToDB tab, click Wizards menu, Change Connection Wizard. Specify a server, a database, and database credentials for your database. Click Next. Click Finish to change connections for the selected tables. Save the workbook to your location. Open the prepared workbook connected to your database. Open the SaveToDB tab and click the Reload button. Set 1 into the IS_DISABLED column to disable loading and clear the value to enable loading. Open the SaveToDB tab and click the Save button. You may change this SQL code for loading option codes from your existing table. Or you may use the preconfigured rtd.OptionListTOS table. You may insert required option codes into the table using any available method. Note that you may use the workbook prepared in the previous step. Copy the OptionListYahoo worksheet to a new one, rename it to OptionListTOS, click SaveToDB, Wizards, Data Connection Wizard, and connect to the rtd.OptionListTOS table. Note that you have to remove expired option codes from the table also. Different editions of RTD.DB have different limits for a number of updated option codes. The Personal edition ($100) allows updating option codes for up to 1000 stocks. See RTD.DB Edition Comparison for details. 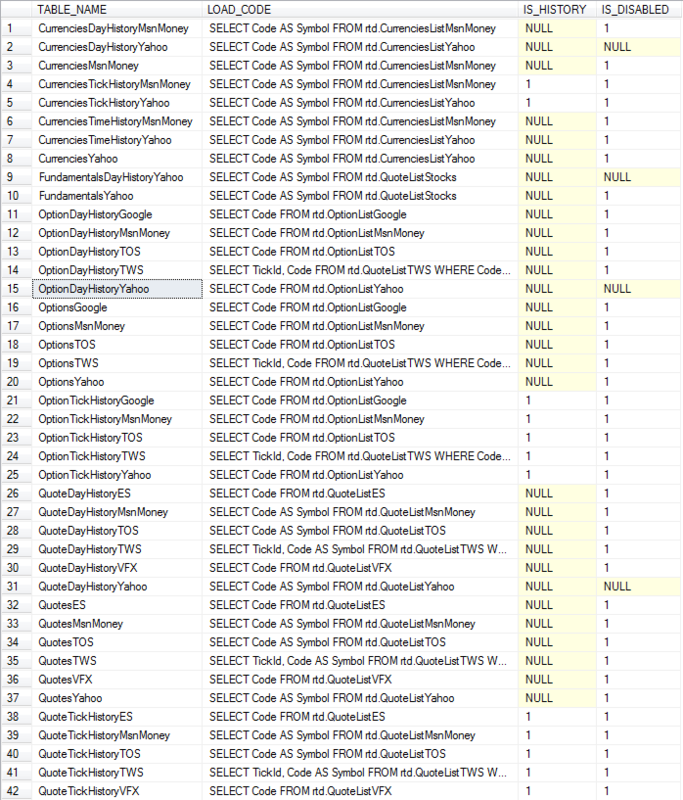 RTD.DB loads option data for specified option codes. It does not load entire option chains automatically. So if you need to load all option contracts for the specified symbols, you may use any solution to get option codes, for example, from Yahoo Finance, and to insert them into the rtd.OptionListTOS table. You may solve this task using Market Data Downloader. thinkorswim is a registered trademark of TD Ameritrade IP Company.